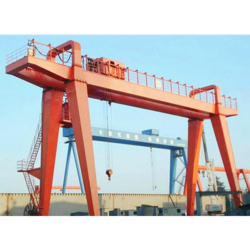 Manufacturer of a wide range of products which include goliath gantry cranes, heavy duty gantry crane and double girder gantry crane. 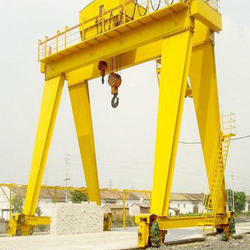 Goliath Gantry Cranes are available in both single and double girder format. It is ideal for outdoor applications where lifting facilities are provided without the cost of a building or any supporting steelwork. They are also suited to indoor applications where existing building structures are not suitable to take overhead cranes, and where additional supporting steelwork would result in a loss of floor area. Goliath-Cranes can be constructed with a cantilever to allow handling outside the rail centers. Typical applications for this type of crane include steel stock yards, loading areas, the concrete industry and ship building. 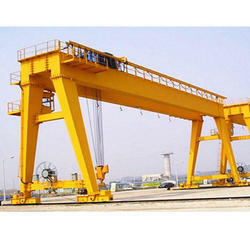 Double Girder Gantry Cranes are available in both single and double girder format. It is ideal for outdoor applications where lifting facilities are provided without the cost of a building or any supporting steelwork. They are also suited to indoor applications where existing building structures are not suitable to take overhead cranes, and where additional supporting steelwork would result in a loss of floor area. Goliath-Cranes can be constructed with a cantilever to allow handling outside the rail centers. Typical applications for this type of crane include steel stock yards, loading areas, the concrete industry and ship building.